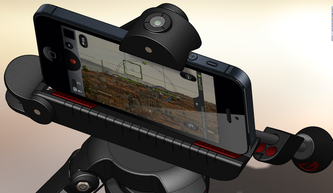 At the CES Show in Las Vegas, January 2015, I came across a very cool new video accessory - the GripGear IndieSolo. It is essentially a counter balanced tripod and holder for your SmartPhone video camera and amazingly makes it easy to shoot smooth moving videos. You can walk with it, go up and down stairs, climb – the counter balance damps out the jiggles and bumps and lets you shoot video that looks very professional. 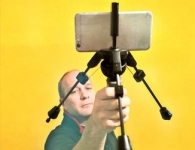 It is essentially an inexpensive “Steadicam” type of device for shooting video with SmartPhones. 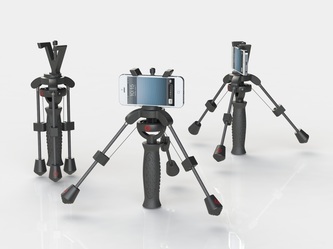 With a cost of only $60 at http://www.gripgear.com/, this is truly a great little accessory for the budding phone cam video producer. 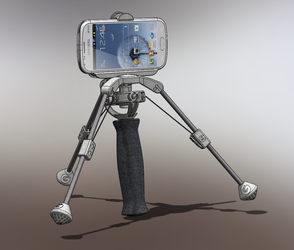 Setting up the GripGear IndieSolo with your phone is easy. The first step is to slip your phone into the locking attachment at the top. Depending on the size of your phone, you may have to remove the p[hone protective case to get into the channel at the bottom of the holder. Once tight, the next step is to balance the phone on the IndieSolo. Pull and twist each leg so that he IndieSol forms a tripod shape. Then slide the leg weights down to counter balance the weight of the phone. It takes a bit of trial and error to get it to where it “floats” as you shoot. The next step is the fun step. Activate your phone video camera and start shooting. By using the indie Solo you can do all kinds of cool, smooth camera moves that usually require a sophisticated crane, Steadicam or other type of camera support device. Check out these videos at YouTube to get a better idea of how it all works. Do you need help promoting your technology products and services? Check out SRS Tech PR at www.srs-techpr.com. Over 20 years successful experience launching new tech products, services and companies!